When manual ultrasonic testing won’t cut it, we offer advanced ultrasonic testing flaw detection techniques to address the situation. PAUT is an advanced NDT method which utilizes multiple elements inside of a single probe housing. This produces a wide array (hence phased array) of angles to inspect for discontinuities. The ability of phased array ultrasonic testing to steer and focus sound allows the technician to size indications more accurately than with conventional ultrasonic testing techniques. Another advantage is the ability of PAUT to pinpoint the location of an indication inside the specimen. Height, length, and depth readings from the surface offer the technician more clarity in characterizing the flaws. This is something that is not possible with conventional ultrasonic testing. 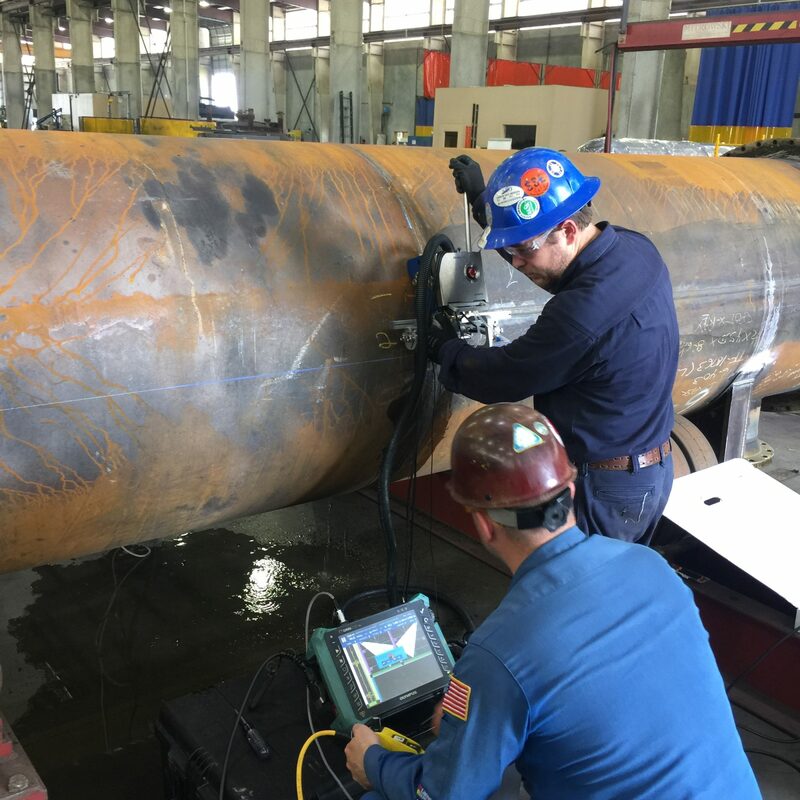 Finally, unlike radiographic testing, phased array ultrasonic testing crews can work alongside other crafts which improved productivity on the worksite. This reduces cost for overnight work and scheduling conflicts between contractors. Time of flight diffraction (TOFD) is another ultrasonic testing technique that was originally designed as an alternative to the ultrasonic testing shear wave technique. A primary application for TOFD is sizing cracks with much greater accuracy than other methods. TOFD is typically used on parts where the geometry is congruent on both sides of the weld. For example, pipe-to-pipe welds or plate-to-plate welds where thickness is equal on either side of the weld, are a perfect situation to utilize time of flight diffraction. Lastly, it is important to note that thicker materials often receive multi-zone, focused applications to ensure proper inspection. Both time of flight diffraction (TOFD) and phased array ultrasonic testing (PAUT) are methods with which our technicians and advanced NDT department are expertly trained in. We have handpicked the best and brightest in the industry to assemble a unique team of TOFD and PAUT technicians that have seen it all, and can handle any challenges you may have. There is a significant difference between certifications and experience. Our team has both!